Odor plumes (monitored with TiCl4 smoke) break up into thin filaments. 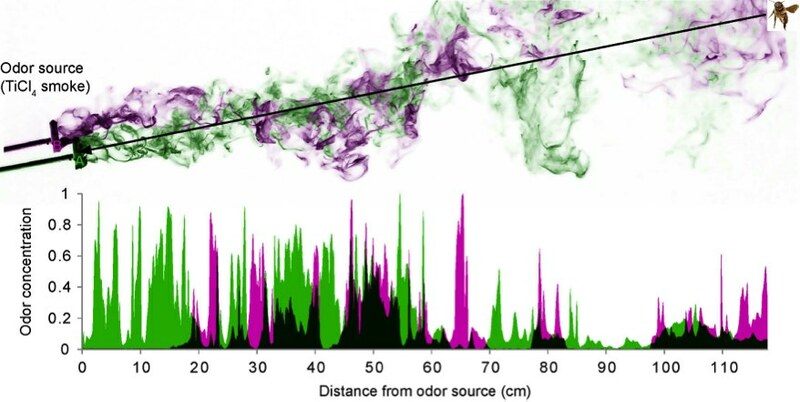 Odor filaments from different odor sources (green and magenta) intermingle. The area chart shows the flucuations of odor concentrations that would be encountered by an insect flying along the black line. Odors occur in turbulent plumes and quickly break into thin filaments that intermingle with background odors. We will measure the temporal structure of natural plumes of multiple odorants originating from separate sources with a flying vehicle equipped with moth antennae. We will use this information to mimic the temporal structure of natural multi-odorant plumes in behavioral and physiological experiments with honey bees (Apis mellifera).